Yesterday, though, nuclear weapons got some long-overdue attention. The front page of the New York Times had two main stories. A comprehensive expose on just how much our nation plans to spend on nuclear weapons sat prominently next to coverage of a massive climate change rally. The facts are that the United States is on track to spend in excess of hundreds of billions of dollars in just the next decade to buy new systems to deliver upgraded nuclear bombs under the guise of deterrence. But to deter who? Remember those other security headlines? Russian and Ukraine, Islamic State and Middle East strife – nuclear weapons have zero role in preventing or mitigating them. The article, U.S. Ramping up Major Renewal in Nuclear Arms, and today’s editorial, Backsliding on Nuclear Promises, are critically important to decades-long policy choices our nation is about to make. The coverage was not an accident. It was the culmination of the work of many people and organizations, and Ploughshares Fund played an important role in it. Over the past three years Ploughshares Fund and our partners have worked to elevate awareness around nuclear weapons issues. We’ve helped policymakers and the public understand the staggering costs of these weapons systems. Interviewed for the article was Ploughshares Fund’s own Tom Collina. With twenty-five years in the field, Collina is a recognized authority on the nuclear weapons enterprise. He provided the authors with valuable insight on specific plans for new weapons systems, their estimated costs, and the reality that under current congressional spending limits, lawmakers simply can’t have it all. Heightened awareness about US modernization plans has led to greater Congressional scrutiny. The delay of a new US Air Force-Navy so-called “interoperable warhead” and a new warhead for the planned Long Range Strike Bomber illustrate this new level of evaluation. The suspension of a billion dollar project to make more nuclear components for warheads is further evidence of an increased squeeze on the nuclear budget. Faced with rising costs and pressure from Ploughshares Fund’s budget campaign, the National Nuclear Security Administration ultimately scrapped its multi-billion dollar Plutonium facility at Los Alamos National Lab. The planned Uranium plant at Y-12 is likely next. President Obama has a final opportunity in his Fiscal Year 2016 Budget to pair his ambitious 2009 Prague speech with concrete actions. Reigning back programs will not only save the US Treasury from the unaffordable “modernization mountain,” it is also the only means to make progress towards a “world without nuclear weapons.” The entry-into-force of the New START Treaty showed that there is no substitute for Presidential leadership in reducing the size and role of nuclear weapons. But that alone is not sufficient. Nothing in policy or politics can happen without public support. Ploughshares Fund and our partners will continue to work hard to educate the public, media and policymakers about these costly anachronisms of the Cold War. 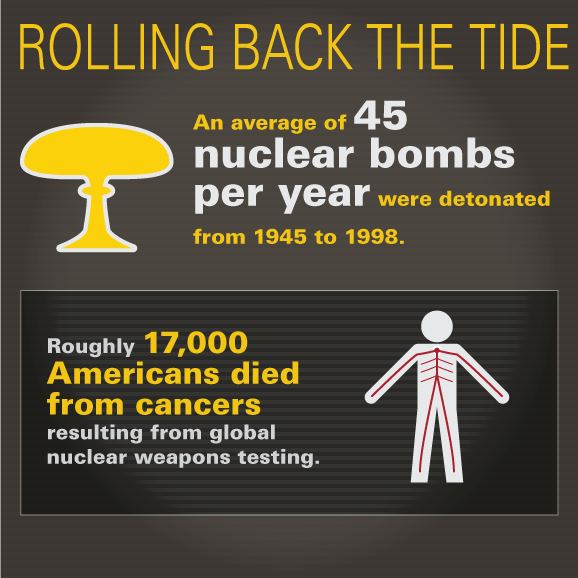 With your support we can retire relics of a bygone era—and in doing so—ending the danger posed by nuclear weapons.